The town abounds with recreation opportunities. 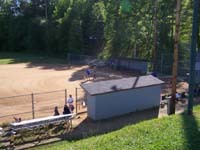 The Town of Mars Hill operates a variety of recreation experiences at its Recreation Park just 2 miles off of Hwy 213 at 690 Park Drive. Tennis courts, a ball field, outdoor basketball courts, a children's playground for ages toddler to 12 years, and a large swimming pool await the public. The pool is open June through August (689-5005). The Park also has picnic facilities adjacent to the pool and playground that is ideal for birthday parties and small gatherings. Reservations for facilities should be made in advance at Town Hall: 689-2301. In addition, there is a 1/2 mile hiking trail around the college practice fields at Ponder Field on Bailey Street. The college also has an indoor swimming pool which is available to the public during specific hours of the week as well as scheduled pool parties (contact 689-1187). The college tennis courts on Hwy 213 are also available to the public when not in use by the college classes or teams. 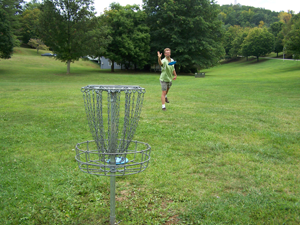 A new addition to recreation opportunities in Mars Hill is an 18-hole Disc Golf Course that traverses the college campus.